ID Card Designer Corporate Edition for Mac design multiple ID cards including employee ID card, student ID card and visitor ID card and gate pass for visitors. Mac OS X compatible ID Card designing software print multiple ID cards with different barcode value and text. You can also browse id card details from Excel file for designing ID Card. Add photo on ID Card by capturing user's photo using inbuilt camera in software. Send designed ID Card to the specified email ID using E-mail setting option. 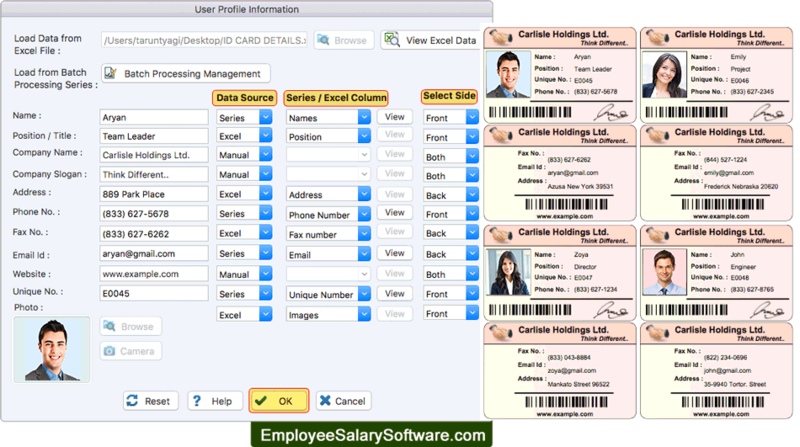 Batch Processing Series : Software design multiple ID cards with different barcode value and text. Camera Setting: You can add photo of id card user on your ID card by clicking image using inbuilt camera option. Design ID Card using Excel: You can also design list of ID cards using Excel data file with the help of 'Live Group and Batch Processing Mode'.